12 Clemson and Iowa remain the only two undefeated teams heading into championship weekend. The Tigers, who are ranked No. 1 yet again in the College Football Playoff rankings, have put together just the second 12-0 season in program history. The first occurred during the 1981 national Championship season. Meanwhile for the Hawkeyes, 2015 marks the first ever 12-0 season by an Iowa team. It is the fifth overall undefeated season in program history and the first since 1922. Both teams will have the difficult task of making it to 13-0 as Clemson faces a hot North Carolina team and Iowa meets with favorite Michigan State in their conference championships. 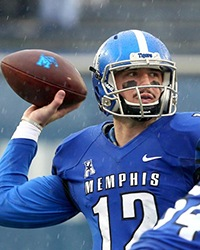 7 Paxton Lynch completed nine passes in the first half and seven of them went for touchdowns in Memphis' 63-0 win over SMU. The quarterback set the school record for touchdowns in a single-game, elapsing the record set by Danny Wimprine against Murray State in 2002. Each of his targeted receivers in the game caught a touchdown pass. He is just the second quarterback to throw for seven touchdowns in FBS game this year after Arkansas' Brandon Allen accomplished the same against Ole Miss. 23 Virginia Tech wanted to have a proper sendoff for Frank Beamer, and now the Hokies will give him a chance at another bowl win. Virginia extended its bowl eligibility streak to 23 consecutive seasons, meaning the last time the program didn't make a bowl game was in 1992. It is the longest active streak in the NCAA. The Hokies passed Florida's 22-game streak set between 1991-2012 and trail Florida State (24), Alabama (25), Michigan (33) and Nebraska on the all-time bowl streak list. 3,000 Christian McCaffrey became just the third player in FBS history to garner over 3,000 all-purpose yards in a single season. The sophomore running back joins former Western Ketntucky back Antonio Andrews (3,161 yards in 2012) and Oklahoma State legend Barry Sanders (3,248 in 1988). 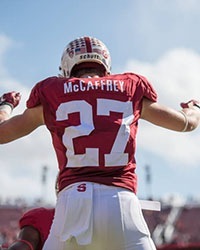 McCaffrey's performance against Notre Dame also allowed him to set the Pac-12 record for all-purpose yards in a single season. 3,768 Ezekiel Elliott rushed past the Michigan defense on Saturday and even surpassed a Buckeyes legend. The junior running back rushed for 214 yards to bring his career total to 3,768 yards, which surpasses Eddie George for second most all-time at Ohio State. Elliott trails only two-time Heisman winner Archie Griffin in the school record book. It was the second time Elliott has rushed for more than 200 yards in a single game and the fifth overall in his career, which tied George's marks. 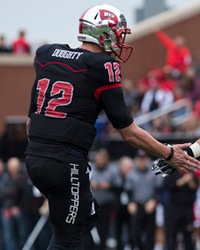 4,000 Brandon Doughty became the third quarterback in FBS history to throw for 4,000 passing yards and 40 passing touchdowns in consecutive seasons. The sixth-year senior tossed five touchdowns and 370 yards against Marshall to bring his season total to 4,184 passing yards and 42 touchdowns. Most of his total yards have come in the first half where Doughty has completed 72 percent of his passes for 3,053 yards, 32 touchdowns and only three interceptions.